My price i nformation for regular ML' s is as follows, with S and F indicating spring and fall. Corrections welcomed! It's sometimes hard to tell from the jackets since prices printed on the jacket flaps were usually clipped when a price increase went into effect. Note how long the 95 cent price lasted in contrast to the $1.10 price. Got this today. What do people think? Were there many price sticker changes? Do folks have examples they can send? I'm a book dealer. I get alot of ML books, but not alot of them have price change stickers. I recently acquired an ML book with a price change sticker on the DJ flap. I scanned the flap and attached the scan to this e-mail. You can post the image on your website if you want. I think you should devote a section of your website to display and discussion of price change stickers. They're important identifiers, because they carry an exact date. The one I have says "as of April 15, 1947" the price of ML is $1.25. 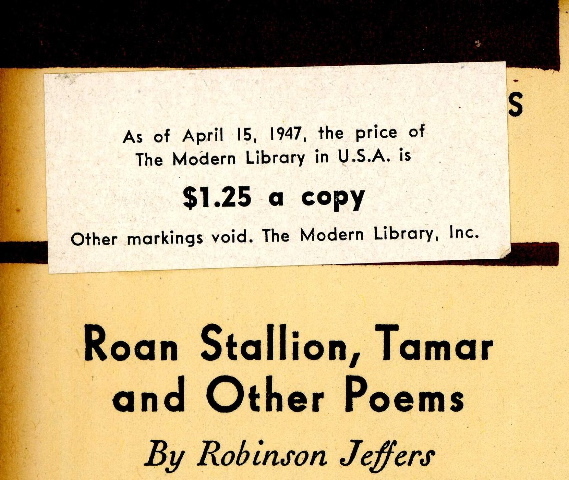 On page 163 of Toledano (revised edition), the year 1948 is assigned to the $1.25 price change. Apparently, he's off by a year. If I'm wrong let me know at   lophke at aol.com .